Ates Orga reviews the Malta Philharmonic Orchestra’s closing concert for the season. The Malta Philharmonic Orchestra’s performance in commemoration of Anzac Day. The Malta Philharmonic Orchestra (MPO) is an orchestra going places. 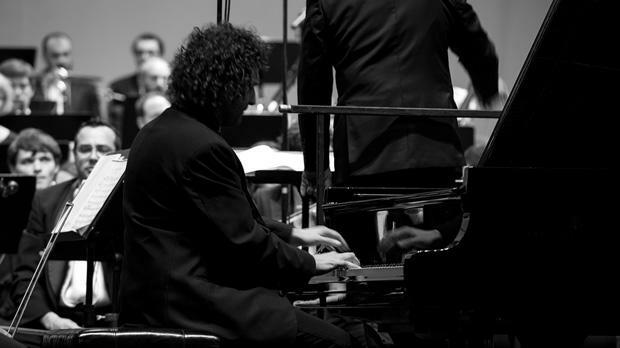 Under Brian Schembri, their galvanic Russian-trained, Paris-based chief conductor and artistic director, their cleverly programmed centenary Anzac Day concert contrasted two popular favourites – Rachmaninov’s Second Piano Concerto and Dvorak’s New World Symphony – with an opener from the late Australian composer Peter Sculthorpe. This performance, with a pre-recorded narration by Peter Hill, whose resonantly antipodean tones set the scene poignantly, brought out the poetry, intimacy and heartache of the music and the trumpet Last Post references are phrased with a timeless, gentle longing. Rachmaninov’s Second Concerto was written in Russia before World War I, but it took another conflict and the very British love affair of Noël Coward’s Brief Encounter 40 years later to secure it its place in the public consciousness. The young, prize-winning Australian pianist and composer Stefan Cassomenos is a thoughtful, questioning artist, whose resolute refusal to treat the work as a merely virtuoso platform allowed us to fully savour its lyrical aspects. He created an often chamber-like interplay with the section principals, encouraging them to engage with him as much as he was listening to them. This said, the big moments were not without fire and thunder and the closing apotheosis was delivered with inexorable climax and finely paced cadence. Schembri, an arrestingly distinguished pianist himself (he studied with Alexander Snegiriov and Sergei Dorensky), provided detailed support and many refinements of colour. Dvorak’s last symphony is an enduring warhorse of the repertory, the popularity of whose tunes belie its architectural subtlety and technical challenge. Schembri is primarily a structuralist. His way of holding a piece together, his shaping and masking of a composer’s joins, his generation of dramatic tension and repose, reminded me of passed greats, of other worlds long ago. Respecting the page, he brought an urgent thrust to the first movement (a real allegro molto for once), emphasising a Teutonic toughness and argument conductors more usually soften, a momentum too often relaxed. It paid handsome dividends. Admirably, he’s a man who takes special care with endings, both in the short and longer term. The close of the slow movement was supreme, basses in ideally murmured D flat accord. Likewise that of the finale, the dying fade held to maximum theatrical effect. With Schembri we are in the presence of an eloquent musician in whom is combined humanity and high art, whose music-making is compassionate, yielding, grand. I warm to his expression, his projection, his rampant, unbridled temperament. The MPO, guest-led by Carmine Lauri, rose to the occasion magnificently. One could not have wished for a more beautiful, more musical cor anglais solo in the largo, nor a more full-throated woodwind song in the scherzo, nor such robustly strident horns and trumpets chorusing their modal cry across the finale. Many a London orchestra would be glad to have such players in their ranks. The final MPO concert of the present season, at the end of May, offers the prospect of Strauss’s Four Last Songs (an old man at life’s end) and Beethoven’s Eroica (iconic fist-shaking genius pre-Trafalgar and Waterloo). I cannot wait. Ates Orga is a Cambridge-based writer who lectured at Surrey and Istanbul technical universities and was formerly with the BBC music Division. A contributor to New Grove, his books include biographies of Beethoven and Chopin and he has published extensively on the work of Charles Camilleri. Orga is also recipient of a Royal Philharmonic Society Music Award in 1993 and winner of the 2007 Liszt International Grand Prix.